When David was a child, he was the only survivor of a brutal attack on a bank by the Epic known as Steelheart. Epics have super powers, but no one is exactly sure how they got them, or why certain people are chosen and not others. What David does know is that Epics beat mankind into submission, and the fearful life mankind leads is not the life he wants any longer. Unfortunately, the man who killed his father and the epic who David wants revenge on, is the invincible Steelheart. At least, everyone thinks Steelheart is invincible. But David knows a secret, a secret that Steelheart himself killed to have buried. David knows Steelheart has a weakness. He just has to figure out what it is. There are so many fantastic things about this book. There was not a dull moment. You can’t honestly say that about many books. Even the “down time”, Sanderson is revealing something extremely interesting, or vitally important to the plot. David is a great hero. He’s impulsive, yet extremely intelligent, focused (sometimes too focused) and he uses those attributes to aid a rebel group known as The Reckoners. David has a lot of emotional baggage to wade through, and it was interesting to see him come to terms with the darker parts of him that have been driving him his entire life. Fortunately, those parts drove him directly to the Reckoners. Each one of the Reckoners was interesting, had their own obvious strengths and weaknesses and were distinctive people. I was intrigued by Megan, and her back story; I really liked her character and was thrilled with the direction Sanderson took her. I had similar feelings for Prof; it was through his character that I feel the reader sees where the series is headed the most, which was fun and exciting to see. So many books these days have secondary characters that just sort of blend in with the crowd. Sanderson creates a group of people who are each memorable in their own way. The Epics were an interesting sci-fi device. They had an infinite range of abilities and weaknesses. The long trek to figure out Steelheart’s weakness was stressful, as I had absolutely no idea what it could be. The great thing about Sanderson’s writing is as you’re moving along, he gives options for explanations for things that seem perfectly reasonable. And then he unveils the actual explanation, showing how brilliant of a writer he is. Steelheart’s weakness was one of those brilliant moments, where my jaw dropped and I started laughing because I couldn’t handle the awesome. There were other similar moments, but I really don’t want to give anything away, so I’ll just leave it at that. There are other fun sci-fi elements, such as cool tech, ridiculously huge guns, etc. 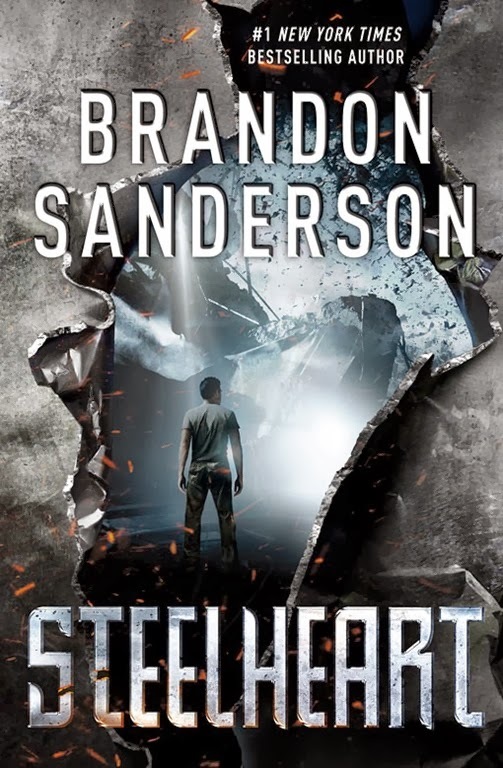 One of the biggest reasons I love the writing in Steelheart is because it’s written so cinematically; you can really imagine it being on a big screen (and I’d be shocked if it doesn’t get snapped up by a production company this year, if it hasn’t been already). The stakes are as high as they can be, and Sanderson doesn’t hold anything back. There were plenty of times where I was left thinking, ‘did he REALLY just do that? ?’ The action scenes are incredibly well written, and they are extensive in the best way imaginable, which is not always the case in YA fiction. This is a great YA book for guys (in my opinion, as I myself am not a guy) since the protagonist is a really great guy character; I highly recommend it for girls as well though, since its just such dang good writing (fear not girls, there are some romance elements. Not a full blown romance, but its there, trust me). One of my favorite reads of 2013, and I absolutely cannot wait to get my hands on the sequel.